I am visiting Microsoft HQ in Redmond this week for their SearchChamps event. Attendance requires the signing of an nondisclosure agreement, and most of what is discussed is non-bloggable. However, the trade off is that we see stuff that is still being developed in the labs (some of it isn’t even at the demo-stage yet). A few of the services, however, are close to launch and are not covered by NDA. They include a new suite of Live.com services. This one excites me the most. Live.com is a fully extensible ajax homepage (see my review here) – there are a ton of third party “gadgets” that can be added to the site and are available at microsoftgadgets.com. Google has a similarly extensible home page. However, unlike Microsoft, Google does not control the operating system for the large majority of worldwide personal computers. 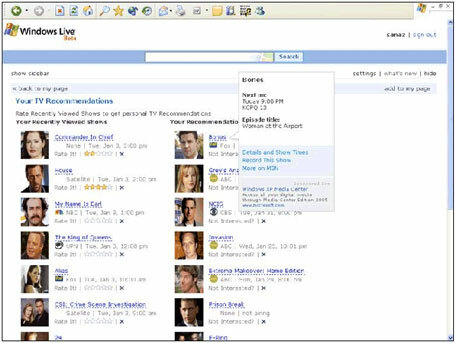 Sanaz Ahari, the program manager for Live.com, announced that Microsoft will allow gadgets to be dragged and dropped back and forth between live.com and the desktop (operating system). And they aren’t waiting for Vista – an update to Windows XP will be coming soon that will allow this drag and drop functionality. The result will be a Yahoo-Widgets like experience, and users will have the further ability to syncronize gadgets between the operating system and the live.com site. Sanaz Ahari also showed some new Live.com/Media Center integration. Anyone using Windows Media Center to record television (I do) will also be able to remotely control their media center to add/remove/edit recordings from any computer, via their passport account and a live.com gadget. We saw a demo of this today and its going to be pretty cool. Note that this is not an annoucement for “remote viewing”, although there are heavy rumors that this is the next step, and it seems pretty obvious. That, of course, will be bad news for Slingbox. Samir Lakhani gave a brief presentation and demo of the new classifieds product called Expo (formerly Fremont) (my posts are here). No real new information was released, although the product is clearly ready to launch. Live.com RSS feeds will soon also include images as well. Screenshot from the presentation is here.